Birth of Albert Ernest Wright recorded June quarter 1892 at Dudley. 2 Darkhouse Lane, Coseley, Staffordshire. Edward Wright (66, General Labourer, born Penkridge), his wife Ann M. (66, born Lapley), and 2 of their grandchildren: Frederick (11, born Sedgley), and Albert Edward (8, born Sedgley). Frederick and Albert’s parents and 7 siblings were living at 5 Darkhouse Lane. 6 Flavell Street, Woodsetton, Staffordshire. Edward Wright (49, Railway Signalman, born Lapley), his wife Mary Ann (48, born Wednesbury), and 8 of their 9 children: Francis Edward (22, Engineering Fitter and Turner, born Deepfields), Frederick George (21, Carpenter and Joiner, born Deepfields), Albert Ernest (18, Works Clerk, born Deepfields), Harold Walter (17, Driller, born Deepfields), Ada Mary (16, born Deepfields), William Henry (14, Works Clerk, born Deepfields), Dorothy Elizabeth (13, born Deepfields), and Horace Leonard (12, School, born Deepfields). Albert and Harold Wright were brothers. Harold had been killed on 2nd May 1915, one of the earliest casualties of the 1/6th South Staffords. Albert was employed by London and North Western Railways at Wolverhampton Railway Station as a Goods Porter. He is commemorated on the Wolverhampton Station memorial, sited on the footbridge at Wolverhampton Station. Albert’s parents paid 15 shillings and 9 pence for the following words on Albert’s gravestone: “Our beloved son. A good soldier of Jesus Christ and his Country. R.I.P.” The same words were inscribed on his brother Harold’s gravestone. The opening day of the Third Battle of Ypres, 31st July 1917, can be considered a British success, with considerable ground gained. The British continued to make gains through August and September to a limited extent, but at a huge cost. The Battles of Menin Road, Polygon Wood, and Broodseinde Ridge could all show some ground gained, but at the Battle of Poelcapelle on 9th October 1917 success was harder to identify. The 56th Field Ambulance was attached to 18th (Eastern) Division. They were involved in the next phase of Third Ypres, the First Battle of Passchendaele on 12th October 1917. This was a low point of Third Ypres; 13,000 casualties for no appreciable gain. The Ypres mud was as bad as it ever was, and men would simply be lost into the morass. The 18th (Eastern) Division attacked near Poelcapelle, and were cut down in large numbers by the un-suppressed German machine gun fire from Poelcapelle. 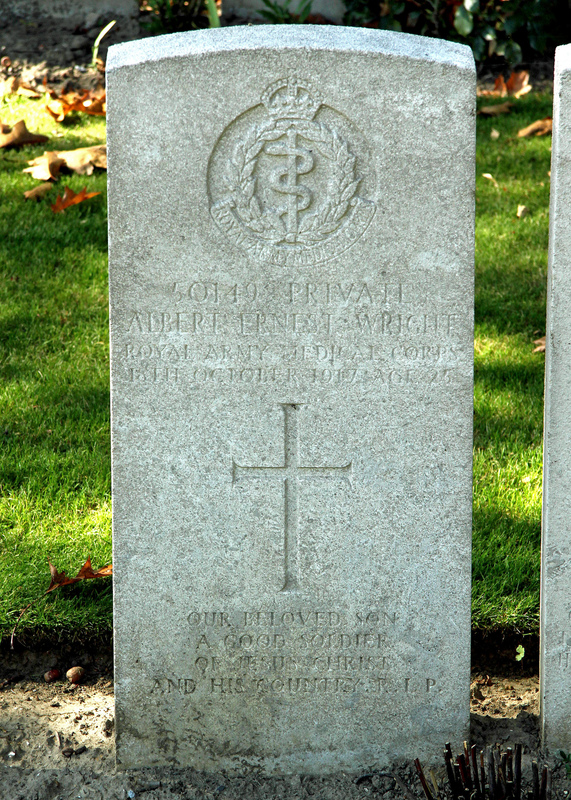 It is likely that Albert, as a member of the Royal Army Medical Corps, was hard at work on this horrendous day. Despite this disaster, plans were immediately made for a second attempt on the 26th October. It was during this hiatus, on 18th October 1917, that Albert was killed. Albert’s family received a letter from his Sergeant saying that Albert was carrying some wounded near a dressing station when a shell burst near him, and he died a few minutes afterwards. Albert is buried in Bard Cottage Cemetery, about 2 miles north of Ypres. 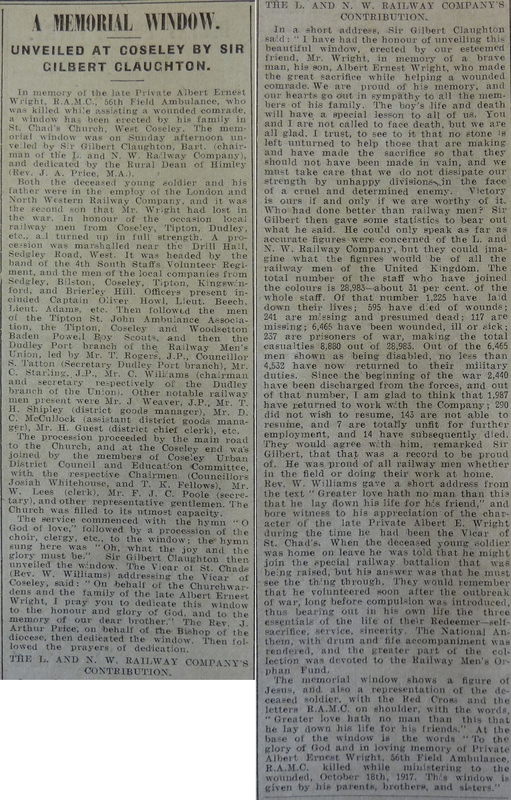 Mr. and Mrs. Edward Wright, of 6, Flavell Street, Woodsetton, have received news of the death of their second soldier son. Few families have the record of having given two sons in sacrifice for their King and Country, and a third yet serving. 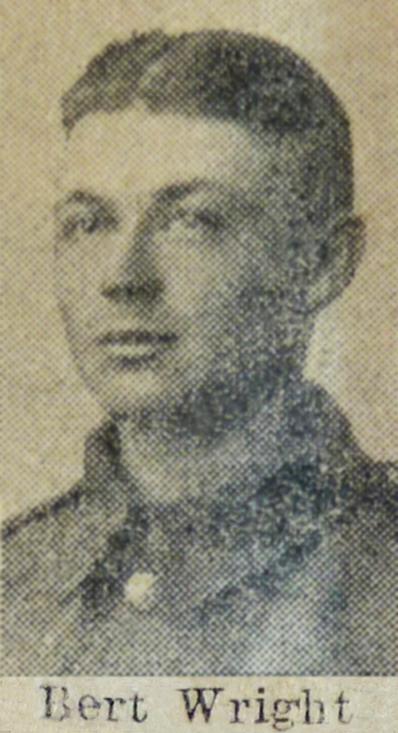 Sergeant Harold Wright was killed in May 1915, and was one of the 6th South Staffs Territorials. Frank, the eldest son, joined the Life Guards in October 1914 and is now a Flight Sergeant in the Royal Flying Corps. Albert (or Bert), joined up in January 1915, and like many other Railway employees, attached himself to the R.A.M.C., leaving for France in July of the same year. He might have transferred to the Railway Battalion after his leave, in June 1917, but elected to stick to his post and see things through. He was killed on Thursday, October 18th, the day after he had written his last letter to his mother. His Sergeant writes: He was carrying some wounded, not far from the dressing station, a shell burst near him, and he died a few minutes afterwards. We shall miss Bert very much. He was always smiling, whether at work or play.” Much sympathy is felt for the parents and family. Bert was associated in the last year or two with St. Peter’s, Upper Gornal, but was formerly a member of St. Chad’s, West Coseley. He was straight and manly, and his quiet reserve hid a deeper spiritual character. His father is respected universally, and is a member of the Coseley Tribunal. The two sons whom he has lost, were worthy of such a father and mother, and are types of that British manhood of which the war is taking its toll. Please click on the image to view the attached newspaper cutting in full size.